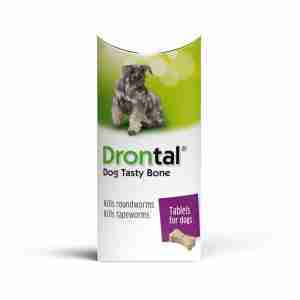 Drontal Dog Tasty Bone Tablets are a simple way to kill most intestinal worms in dogs, with a bone-shaped design to make them more appetising to your pet. Drontal Dog Tasty Bone Tablets target gastrointestinal parasites such as tapeworms and roundworms that rob your dog of the nutrition they need to live active and healthy lives. The active ingredients of praziquantel (the only tapeworm ingredient approved for Pet Travel Scheme (PETS) certification), pyrantel embonate and febantel get to work straight away, helping to quickly kill off the worms and prevent further harm to your pet. The tablets can be given as a single dosage as part of routine worming, generally once every three months in adult dogs. They're designed to look like bones and have a tasty meat flavour so you can give them to your dog without hiding them in food, meaning you don't need to work around their feeding schedule. can be used as a single dosage as part of routine worming. It's fairly easy for dogs to pick up parasitical infections – tapeworms can happen after your dog swallows an infected flea, usually while grooming themselves. Common signs of worms might include vomiting, diarrhoea, or anaemia. As a general guide, it's a good idea to de-worm them every three months as adults. As well as routine worming, it is recommended to treat your dog for fleas at the same time to reduce the chances of reinfestation. Use Advantage Spot on Treatment to keep your dog protected. Each tablet contains 150 mg febantel, 50 mg pyrantel (equivalent to 144 mg pyrantel embonate) and 50 mg praziquantel. Do not use in case of hypersensitivity to the active substances or to any of the excipients. Do not use during the 1st and 2nd third of pregnancy. For each additional 5 kg body weight, administer an additional half tablet. The tablets can be administered with or without food. Tablets should be given as a single administration. The advice of a veterinarian should be sought regarding the need for and frequency of repeat treatment. Not for use in dogs weighing less than 2 kg. I wouldnt hesitate to recommend this company. I have always found their website easy to use, good prices and fast delivery. I wont be using one else for my pets. An easy to administer wormer, my dog takes it in her food. It never upsets her tummy. I trust it and have used it for a long time. You cant go wrong with Drontal. Good price, easy to use, good instructions, been around for years, never makes my doggys tum upset. The only wormer I trust after years of use.